In a partnership between Universities and commercial organisations both in Indonesia and the UK, Bangor University has been successful in securing a £10,000 grant from the British Council Indonesia to seed-fund research projects that will help return disused former mining sites into productive land. As a country rich in natural resources, Indonesia has undergone rapid economic development over the last 10 years; with the growth of extractive industries, such as coal mining, contributing greatly to the economic development of the country. Of concern however, are the environmental problems that can arise during, and particularly after, mining has ceased. These may include soil and forest destruction, production of acid rock drainage, pollution of air, water and soil and the creation of harmful waste. Universities and research organisations, in partnership with a state-owned mining company PT Bukit Asam have formed a consortium to tackle these problems and to develop and disseminate best-practice approaches that will benefit Indonesia and the region of south east Asia. An impressive partnership of nine Indonesian Universities are involved including six other Indonesian private, commercial and governmental organizations. The partnership will run projects relevant to the various environmental challenges faced in Indonesia which include improvement of soil and water quality and the development of agroforestry techniques. In addition, the partnership will provide opportunities for academic exchanges between institutions and for PhD opportunities for Indonesian students in the UK. SENRGy’s Prof Morag McDonald who led the successful funding bid noted that “we’re delighted to be leading this research in collaboration with colleagues in Indonesia and the UK. The partnership gives us an opportunity to develop and share our expertise in the study, and reclamation of former industrial landscapes developed in the UK and Europe. Working with colleagues in Indonesia provides a fantastic opportunity to address the challenges posed to pollution and reclamation by tropical climates”. 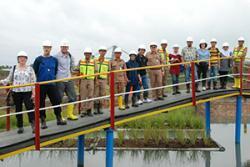 The first step of the partnership saw SENRGy staff (Professor Morag McDonald, Dr Paula Roberts and Dr Graham Bird) attend a workshop held at the Indonesian base of SEAMEO BIOTROP in Bogor, West Java in late March 2014. The workshop was preceded by a visit to the PT Bukit Asam coal mine at Tanjung Enim, a 6.4 billion tonne coal reserve in South Sumatra. The group were able to view some of environmental problems as well as the approaches taken by PT Bukit Asam to tackle these.